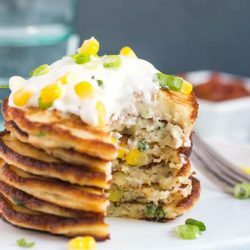 These leftover mashed potato and corn pancakes are light and fluffy, and extremely moreish. They are a great way to use up excess leftover mashed potato, and are delicious served with sour cream or relish for a quick and easy lunch or dinner. Place the cold mashed potato into a large bowl. Break the mash up slightly with a whisk. Whisk the eggs and the milk together, and pour the mixture into the bowl with the mashed potato. Stir the liquid into the mash, working out lumps with the whisk, until the mixture is smooth. Stir the spring onion and corn into the potato mixture. Add the flour, baking powder, and salt & pepper to the bowl. Gently stir the flour into the wet ingredients to create a smooth batter. Line a dinner plate or small baking tray with kitchen paper and set aside. Add enough olive oil, ghee or both, to the fry pan to cover the base. Spoon 2 -3 Tablespoons of batter into a mound in the fry pan. The batter will spread out as it warms. Leaving room for spreading, repeat this action to create as many pancakes as will fit in the fry pan. Cook the pancakes for 2 -3 minutes, or until they are golden and solid enough to flip. Turn the pancakes, and continue to cook for another 2 -3 minutes, or until the other side is golden. Remove the cooked pancakes from the fry pan, and sit them on the lined plate or tray. This will allow any excess fat to be absorbed by the kitchen paper. Repeat this process with the remainder of the batter, adding more oil/ghee to the pan as required, until all the batter is cooked. Serve the pancakes immediately, or keep them warm in a low oven whilst you finish cooking the remainder of the pancakes. I like to fry these pancakes in a mixture of olive oil and ghee, which gives them a lovely crisp exterior. Butter will work in place of the ghee. These are best straight from the fry pan, but can be kept warm in the oven until required. Serve the pancakes with tomato relish and sour cream for the perfect light lunch. Use a gluten-free all purpose (plain) flour to make the pancakes gluten free.